Happy belated Thanksgiving! It’s been so long since we’ve published a blog post here. Since we left for college, we sadly have not had access to a kitchen (I can’t wait to be an upperclassmen when I have a kitchen in my dorm!). College has been going really well, but it was wonderful going home for Thanksgiving and getting back into the kitchen for a bit. We made some of our favorite things- lots of salad, these awesome pizzas from Smitten Kitchen, chocolate chip cookies, apple cake, French onion soup grilled cheeses, and more. Amongst the “more” is this cake, which we made in honor of our birthday/our Dad’s birthday (both of which happened while we were away at school). It’s two layers of pumpkin cake with a layer of dark chocolate cake, chocolate chip cream cheese filling, and dark chocolate frosting. It was also supposed to have a layer of caramel, but unfortunately we had to eyeball the temperature we were supposed to cook it to since our thermometer broke and miscalculated a bit, so our caramel seized up. Oh well! The cake was still fantastic without it, and very decadent (although I’m sure the caramel wouldn’t be an unwelcome addition!). The frosting is really reminiscent of fudge sauce, but thicker. This was definitely a nice treat to have at the beginning of break! We will be cooking up a storm throughout December/January when we go home for break, so there will hopefully be more blog posts coming during that time. Preheat oven to 350° F. Spray an 8-inch round cake pans with cooking spray and line the bottom with a parchment paper round. Into a large bowl, sift flour, sugar, cocoa powder, baking powder, baking soda and salt. In a medium measuring cup, combine the buttermilk, ,coffee, oil, egg, and vanilla. Add liquid ingredients to dry ingredients and whisk until smoothly combined, for about 1 minute. Pour the batter into the cake pan. Bake on the middle rack of the oven until a toothpick inserted into the center comes out with a few crumbs, about 20 minutes. Let cool for 10 minutes and turn onto a wire rack to cool completely. Spray two 8-inch round cake pans with cooking spray and line bottoms with parchment paper rounds. In the bowl of an electric mixer fitted with the paddle attachment, beat the sugar and eggs together on medium-high speed until fluffy, about 5 minutes. Add oil and vanilla and beat for 30 seconds on medium. Add pumpkin and mix for 30 seconds more. In a medium bowl, whisk together the flour, baking powder, cinnamon, ground ginger, nutmeg, and salt, and add to the pumpkin mixture on the lowest speed. Divide batter between prepared pans and bake on the middle rack of the oven until a toothpick inserted in the center comes out clean, about 25 minutes. Let cool for 10 minutes and then invert onto a rack to let them cool fully. In a medium saucepan over medium heat, stir together the sugar, water, and lemon juice. Brush down the sides of the saucepan with a wet pastry brush and increase the heat to medium-high. Stop stirring and let the mixture cook until it turns amber, about 8 minutes. Quickly remove the saucepan from the heat and add the heavy cream and butter (the mixture will bubble/steam). Return the pan to medium-high heat, and using a candy thermometer, cook until the caramel reaches 248°F. Transfer the caramel to a heatproof bowl and stir in the vanilla and sea salt. It will thicken as it cools. Store in the refrigerator up to 2 weeks. In the bowl of a stand mixer fitted with the paddle attachment, beat the butter on medium speed until light and fluffy, about 2 minutes. Add powdered sugar, vanilla, and salt, and beat on low until combined. Increase the speed to medium and beat for 6 more minutes until light and fluffy. Add cream cheese and beat for 1 more minute. Stir in the chocolate chips. Keep refrigerated for up to 3 days. Melt the butter in a medium saucepan over medium heat. Stir in the sugar, cocoa powder, and salt. The mixture will be thick and grainy. Whisk in the heavy cream and sour cream. Heat until hot to the touch and smooth, about 5 minutes. Remove from the heat and whisk in the vanilla. Transfer frosting to a heatproof bowl and let cool. Refrigerate until spreadable, about 3 hours. 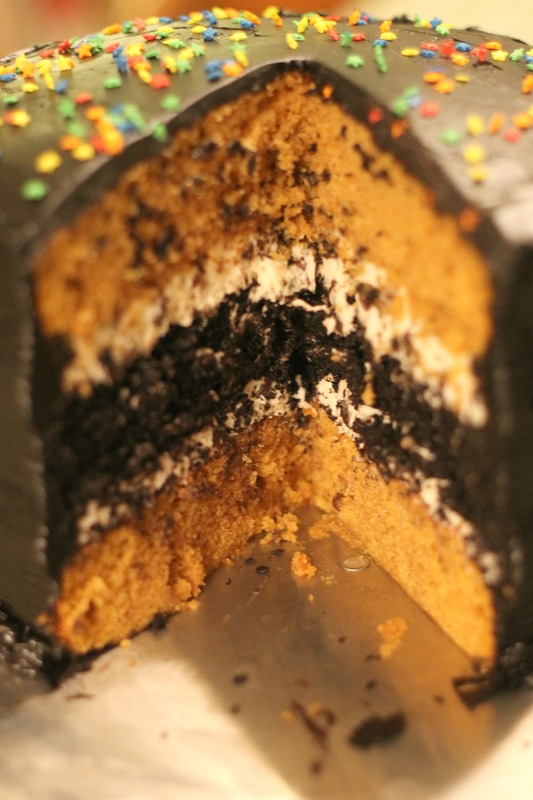 On a cake board or plate, place one of the layers of pumpkin cake. Spread half of the cream cheese filling across it, and then top with half of the caramel (leaving 2 inches around the perimeter of the cake for the frosting to spread). Place chocolate cake layer on top and repeat with another layer of the filling and caramel. Top with a layer of the pumpkin cake. Refrigerate the cake for 30 minutes. 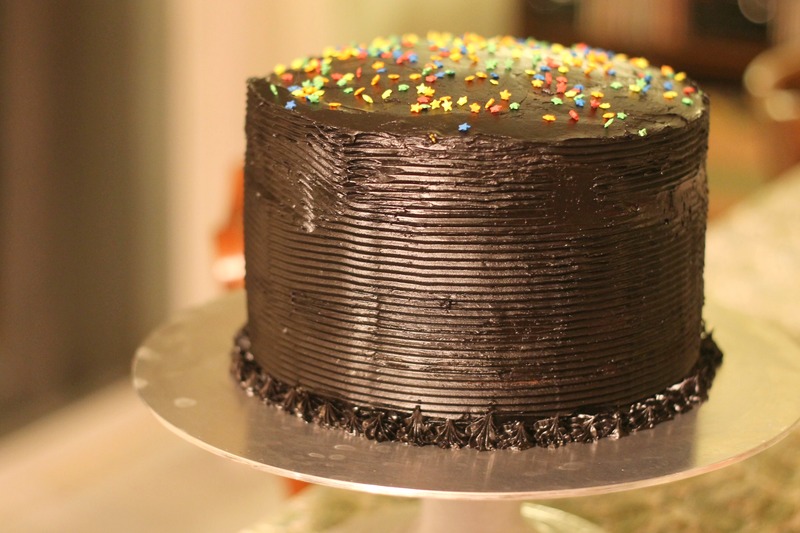 Frost entire outside of cake with the frosting, using a thin layer. Refrigerate for 15 minutes, and repeat with another layer of frosting. If desired, use a piping bag to decorate the cake and a pastry comb around the sides of the cake. Top with sprinkles, if desired. 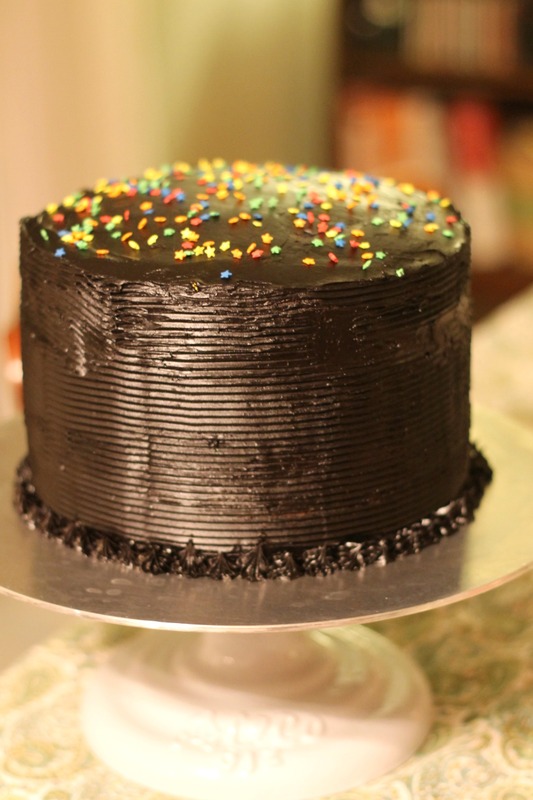 Keep the cake refrigerated if not using immediately (let refrigerated cake sit for 2 hours before serving). Serve and enjoy!